The ballots are in… Igleheart Yellow Cherry Tomato was selected as the best tasting tomato at Seed Savers Exchange in 2015! Ever wonder about the names of your favorite heirloom tomatoes? Some names are rather descriptive of the color, shape, or place they came from (Hungarian Heart, Green Sausage, Wapsipinicon Peach), others just make you scratch your head (Mortgage Lifter), and still others are equally descriptive and curious (Hillbilly Potato Leaf, Trucker's Favorite). We put together a guide for you to have some fun and figure out what your heirloom tomato name could be! Comment below to tell us your heirloom tomato name! Despite concerns that our tomatoes would not ripen in time for the event, over 40 heirloom and open-pollinated tomato varieties (and one mega-mart hybrid tomato) competed for the title of this year's favorite. SSE staff, friends, and family brought tomatoes from gardens across northeast Iowa and Wisconsin to serve over 800 event attendees. The ‘Dester’ took home the blue ribbon at the 6th Annual Tomato Tasting and Seed Saving Workshop at Heritage Farm last weekend. With over 40 varieties in the lineup, the competition was steep for this year’s unlikely winner. The ‘ Dester’ tomato was something of a Cinderella story from the SSE trial gardens. Every year our commercial crew grows out a number of new varieties from the collection or from member-growers to discover new offerings for the SSE catalog. This year a champion was born! The ‘Dester’ is a large, full-flavored, pink beefsteak tomato. It was the first tomato on the sampling line, yet the flavor stuck in visitors’ minds when it came time to cast their vote—more than 40 tomato samples later. Visitors passed through the display gardens snapping pictures of the towering, 10-foot-tall ‘Hot Biscuits’ amaranth, and the barn wall completely covered in ‘Grandpa Ott’s’ morning glory on their way to seed saving workshops. “The joy of gardening is that there are no absolutes,” said LeHoullier before prompting the crowd for their favorite qualities of heirloom tomatoes. Meanwhile SSE staff led a hands-on workshop on saving tomato seeds. The workshop covered everything first-time seed savers would need to know to start saving their own seed, including ideas of what to do with extra seeds, like trying a home germination test. While the adults took notes at the workshops and tasting tables, the kids displayed the fun factor of heirloom tomatoes with a tomato toss and ketchup-making activity led by SSE Display Gardener Grant Olsen. “I already have a few ideas of how to make the tomatoes a little sloppier for next year’s toss,” said Olsen with a grin. Whether you were tasting, tossing, or taking notes, we hope everyone walked away from this year’s Tomato Tasting and Seed Saving Workshop with a little inspiration for their own gardens. Take the seeds out of your best looking tomatoes and put them into any container that can hold liquid. Don’t worry if there is pulp in with the seeds. Keep as much juice with the seeds as possible. Some seed saving techniques suggest adding water to the mixture. We recommend not adding water unless the mixture evaporates before it starts fermenting. This can be done by adding about ½ cup of non-chlorinated water to 1 cup of tomato seed and pulp. Fermentation should happen in 24 hours-4 days. This depends on many variables such as air temperature or how ripe the fruit is. A layer of white mold may grow across the top. Once this mixture has fermented continue to the next steps so seeds do not germinate. Think about where to put the tomato seed mixture because inevitably it will smell. You may want to cover your mixture with a mesh screen to keep out fruit flies. After fermenting, add water and stir. Mature seeds will sink to the bottom. If the seed is light enough to float, it is probably not fully formed, mature, or viable. Don’t save these seeds. Pour off pulpy mixture, but not the viable seeds in the bottom of your container. Pour the remaining liquid into a kitchen strainer and wash thoroughly under the faucet until clean. Drain, and then spread the seeds out thinly on surface to dry. Any substrate to help them dry as quickly as possible will work: coffee filter, paper plates, paper towel, or wax paper. It is best to dry seeds out of direct sunlight; this could take up to 4 weeks. Store the seeds in an envelope or seed packet and place in a dry, cool location. You can assess the quality of your storage conditions by adding the room temperature in Fahrenheit plus relative humidity. Try to keep that number under 100; the lower the number the better the conditions for seed storage. Note from a seed saver: Tomatoes will, most commonly, self-pollinate, so seeds saved will remain ‘true to type’ without worrying about cross-pollination. However, there are always exceptions. Some tomatoes can cross pollinate, this is dependent on many factors such as flower shape, environment, and biodiversity. To ensure seed purity you may want to plant only one variety or spread different varieties throughout your garden. Ok, we have a secret; it’s in the public’s best interest that we come clean with this information. We at Seed Savers Exchange have ulterior motives behind the upcoming Tomato Tasting and Seed Saving Workshop at Heritage Farm on September 3rd. 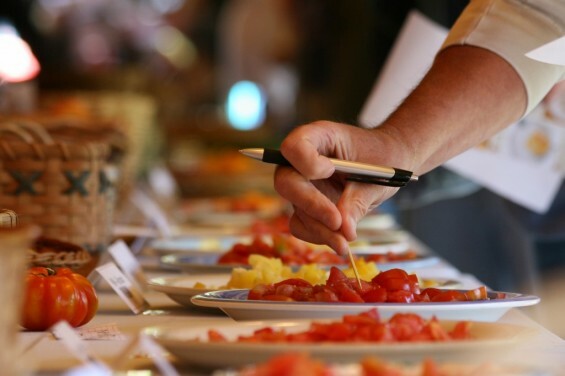 If you’ve been to the Tomato Tasting in years past, you know that (on the surface at least) this event is a celebration—a festival of flavors, colors, textures, shapes and sizes. In fact, this year visitors will have a chance to sample 40 to 50 different varieties of heirloom tomatoes, ranging from yellow cherry tomatoes to pink beefsteaks and striped stuffing tomatoes. However, we’ve heard from a reliable informant that there will also be a few “new” varieties in the lineup—that is, varieties not currently offered in the Seed Savers Exchange Catalog—or any seed catalog for that matter. This year’s Tomato Tasting will, in fact, feature a few varieties from the SSE collection. Not only do these “trial” varieties keep regular visitors to our Tomato Tasting on their toes, they also represent a critical aspect of SSE’s preservation work. Each year SSE’s Preservation garden crew grows out accessions from our collection to regenerate seed. During this time Preservation staffrecord vegetative characteristics, evaluate the quality and quantity of fruit, and save enough seed to preserve in our long-term storage facilities. Towards the end of the growing season, SSE staff, local market gardener Eric Sessions, and Board Member David Cavagnaro, tour the preservation gardens looking for stand-out varieties. These stand-out varieties are then grown for further evaluation by the Commercial garden crew the following season. My friend Emmy was born in Transylvania which used to belong to Hungary. At the end of WW II she was expelled (she was of German descent) and had to leave her house. As she left in the fall of 1945, she grabbed a tomato, managed to keep it throughout the arduous journey into Germany and kept planting the seeds of her Transylvanian tomato. I met Emmy in 1978 in Rosenheim, Germany and when we left in 1979, Emmy gave me some seeds of her Transylvanian tomato. I have planted this tomato every year, first in Eugene, Oregon and then in Tigard, Oregon. The tomato is yellow, does not grow very large (at least in my garden) and has a very intensive tomato flavor. If you wish, you may name the tomato Emmy! “New" or “trial” varieties making an appearance in this year’s Tomato Tasting include the ‘Strawberry’ as well as the ‘Emmy’ tomatoes, both of which are not currently commercially available. However, with your help, that could soon change. We hope you’ll join the conspiracy by attending this year’s tasting and telling us what you think of each variety. Your opinion, and vote, will help us determine the lineup for future catalog offerings!